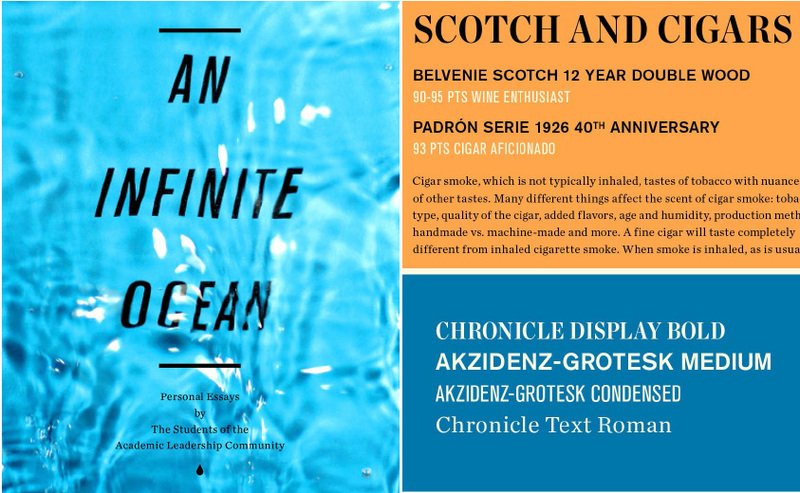 When asked about their favorite type pairing, Shannon admits "anything paired with Gotham is a great start," and Jay mentions he likes "Akzidenz-Grotesk blended with the delicious scotch-style serif Chronicle." Apparently, there is a couple different design sensibilities working beautifully together here. Parallel-Play, the husband and wife design team of Jay Doronio and Shannon Losorelli-Doronio that focuses on social conscious design. This creative pair has done some amazing work for 826LA, Bike Long Beach, Echo Park Art Walk, L.A. Louver Gallery, Chronicle Books and more. What pairing has you currently captivated? Shannon: For the L.A. Louver Frederick Hammersley exhibition in 2012, we paired Gotham with Mercury. We knew how well Gotham would translate from environmental graphics to the exhibition catalog and digital communications and we also knew that Mercury would compliment Gotham very well in the 10" x 10" catalog. Coming up with this pairing was particularly fun because in addition to being a fine artist, Hammersley was also a graphic designer. We looked through some of his design work and previous publications and consulted with one of the gallery directors, Elizabeth East (who knew Frederick personally). We learned that he was a pioneer in the field of computer generated graphics, using one of those ginormous main frame computers and punch cards at University of New Mexico in the late 60s to generate printed compositions that can only be described as ASCII art versions of his famous geometric works. It seemed fitting to choose classically inspired new comers like Gotham and Mercury to be the face of Hammersley at L.A. Louver. Jay: What I really enjoy about Akzidenz-Grotesk is the subtle inconsistencies between weights, it adds a considered level of funk that reminds me of hand-painted signage. For Chronicle, one gets this lovely hybrid of both Old Style and Modern figures that satisfies my fix for a beautiful classical serif and a typeface that is tough enough to withstand a variety of printing demands. Sometimes when I think about type combos, I approach them in terms of fashion; since both require a good sense of hierarchy. For example, I saw Akzidenz-Grotesk as the bespoke blue blazer; it’s classy, stylish and provides a solid foundation for the rest of the outfit. For this particular occasion, with all the varieties Akzidenz-Grotesk has to offer, we had to keep things dapper with a square tie (Akzidenz-Grotesk Medium) and a tie bar (Akzidenz-Grotesk Light). To complete the outfit some Double Monk Strap Shoes (Chronicle Text Roman) to round everything out. With a pairing like that, who needs pants? Shannon: After taking a trip to Europe late last year, I have been obsessed with neo-humanist typefaces. They are everywhere over there and it was really inspiring to see the various ways that they are used. One of my current favorites is Andes by Latino-type (also a favorite type foundry in our office). Latino type has created wonderfully flavorful typefaces, from display type to scripts and everything in-between they have been producing some really hot stuff in the last few years. We actually used Ragazza script in our wedding invitations, to us it just seemed to embody authentic L.A. street style we love so much without being ridiculous or gimmicky. Jay: Lately I’ve been in love with Ronnia, designed by José Scaglione and Veronika Burian of Type-Together. Ronnia is a Humanist typeface that adds some light-heartedness to any palette and is uber versatile—did I mention I love versatile typefaces? Without geeking out over the shapes of bowls and counters, which I do all too often, I really love the variation that happens to some of the characters in the italics. I don’t want to spoil anything, but the variants make for a beautiful surprise. What will be your next typeface purchase? Shannon: My type purchases are usually project driven, I have a running wish list of great typefaces and when the right occasion comes along I’ll make the purchase. I’ve been working on building a site for my stationery products and I was excited to see that HF&J is now offering web fonts. Verlag is a top runner for that project. If you see me walking down the street you can guarantee that my entire wardrobe came from TJ Maxx or Nordstrom Rack. I have no shame in saying that I love discount fashion, because it means I can buy full-priced fonts. Jay: Haha… my wife is so funny; we’re so much a like in so many ways. If money were no object, I would buy the complete font collection from Type-Together, just to start. If I were to pick one particular typeface it would have to be either Ronnia or Abril from Type-Together, they both are just beautiful looking typefaces! I think with as much character these two typefaces bring to the table I could see them being used for so many things, both personal and for client work. Thanks guys! Be sure to see more of their work at parallel-play.com or contact them at we [at] parallel-play.com. Type lessons learned in 12 months. Creative Types: What’s Your Typographic Alter Ego?